No matter the size you choose ALL Buckets arrangements are lush and beautiful. Flowers are brought in over the holidays every 3 days to allow the most fresh flowers possible. 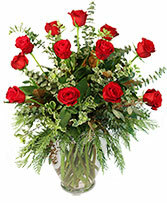 Order from a great florist today. One of our staff favorites. 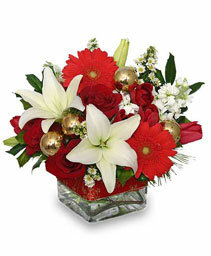 Super sparkles, super fragrant, super delightful arrangement. 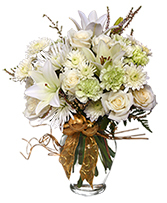 All crisp white flowers with fancy sticks, mesh bow.Ting and babbles This is a magnificent arrangement. The larger the better. What a wonderful way to give flowers. 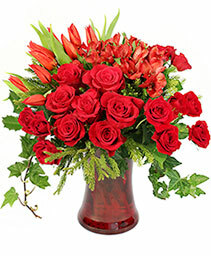 A generous gift certificate so your special person can choose their own flowers. All $50 $75 and $100 certificates are wrapped with a long stem rose and a card with your message. 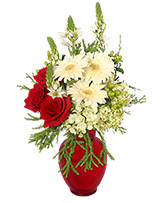 Delivery will be added if you want delivered OR call the store for pick up. 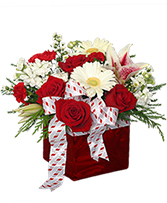 Lovely cube arrangement . 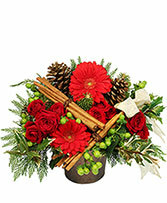 Perfect for a hostess gift. Or order three for the center of your Christmas table. Weave cedar boughs and voila you have an amazing table. 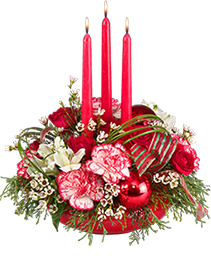 Three candle delightful centerpiece. Very traditional and classic. 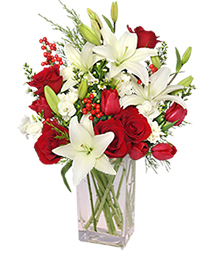 Long lasting flowers for the holiday season. Christmas decorations have come a long way, even since we were younger. It's perfectly normal to see a Christmas tree decorated in glitz and glam. 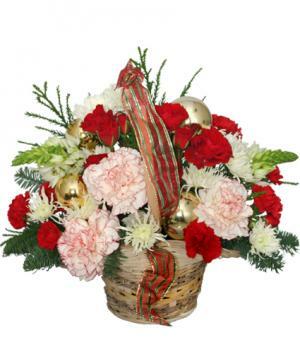 No matter what your style, BUCKETS FRESH FLOWER MARKET is the perfect choice for a Abbotsford Florist and has the right Christmas flowers for you! Whether you need a centerpiece for your holiday party, a hostess flower gift, or a festive Christmas arrangement, Don't hesitate to give BUCKETS FRESH FLOWER MARKET & Florist a call for all your Christmas needs. 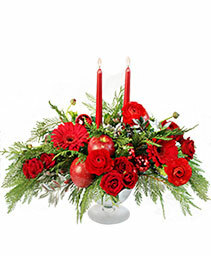 We have fresh and fragrant centerpieces, red rose and white carnation bouquets, pointsetta plants, orchid plants and cut flowers,hurricane candle centerpieces, and custom made flower arrangements to suit your style.